Turmeric is a semi-aquatic member of the ginger family that naturally occurs throughout Southeast Asia. The long, golden-colored taproot is the source of the dried spice we know as turmeric and as the primary seasoning in curry. The warm, spicy and slightly bitter taste of turmeric is widely used to season a variety of meat, rice and vegetable dishes in Middle Eastern and Asian cuisines. The spice is also used to produce a deep yellow dye for coloring various textiles. Because turmeric represents fidelity and fertility in Indian culture, it plays a role in traditional weddings. 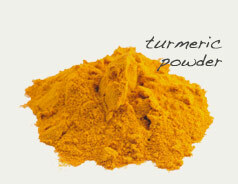 Ground turmeric is also used to make pastes for topical use on the skin. 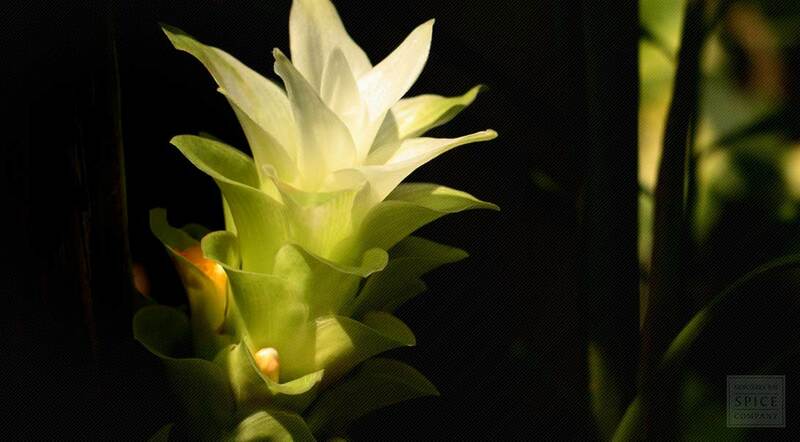 Curcuma longa, or tumeric, is a plant of the Zingiberaceae family; as such tumeric is related to ginger. Turmeric is a perennial herbaceous plant, which reaches heights of up to a meter. The yellow-to-orange cylindrical rhizomes are highly branched and aromatic. The plant's alternate leaves are arranged in two rows. The leaves are divided into leaf sheath, petiole and leaf blade. A false stem is formed from the leaf sheaths. The petiole is 50 to 115 cm long and the simple leaf blades are usually 76 to 115 cm long and on occasion up to 230 cm in length. They are oblong to elliptic and narrow at the tip, with a width of 38 to 45 cm. The plant usually flowers in August. Terminally on the false stem there is an inflorescence stem containing many flowers. Its bracts are light green. Its shape can be ovate with a length of 3 to 5 centimeters to oblong with a blunt upper end. At the top of the inflorescence stem bracts are present on which there are no flowers. These bracts are white to green and sometimes tinged reddish-purple and its upper end is tapered. The plant's fruit capsule opens with three compartments. The word tumeric is from Middle English / early modern English turmeryte, tarmaret, which is of uncertain origin. Possibly from Middle French terremérite meaning "worthy earth". 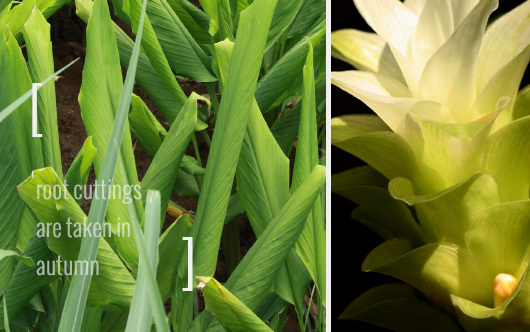 Curcuma longa is native to tropical Tamilnadu, in southeast India. Turmeric grows in warmer temperatures, from between 20 °C and 30 °C (68 °F and 86 °F). The plant requires a considerable amount of annual rainfall to thrive and it prefers light shade. Turmeric thrives best on loamy or alluvial fertile soils; it cannot tolerate soil that is waterlogged. Turmeric plants are collected each year for their rhizomes, and then are propagated from some of those rhizomes for the following season. Plant turmeric rhizomes into warm soil during the fall (September or October). The rhizomes should be planted 5-7 cm deep. Turmeric rhizomes are harvested 9 to 10 months after planting. When the lower leaves turn yellow or when stems dry and fall over rhizomes have reached maturity. If desired it is possible to dig carefully at the side of a clump and harvest some of the rhizomes as needed rather than collecting the entire clump. When the rhizomes are not used fresh, they are boiled for about 30–45 minutes and then dried in hot ovens. Once dried, they are ground into powder characterized by its bright orange-yellow color. Tumeric powder should be stored in an airtight container in a cool, dry place. Whether chopped, sliced, grated or ground, turmeric provides bright	color and imparts a robust, peppery flavor and aroma with a hint of aged wood. It provides the characteristic golden color of curries	and dhal, a type of stew made from hulled, split lentils or peas. Turmeric is also featured in piccalilli an Indian chutney, and in kedgeree (pickles), as well as in rice, vegetable and seafood dishes. According to Hindu tradition, turmeric is associated with invoking	fertility. Brides are adorned around the neck with a special thread	coated with a paste made from turmeric as marriage vows are made. A	traditional wedding is often preceded by a celebration called Gaye	holud in which family and friends paint elaborate designs on the	bodies of the couple using turmeric paste. This ritual, so named	because it literally means "yellow on the body," illuminates the	skin of the bride and groom with a beautiful golden stain for two to	three days before the nuptials take place. Turmeric is also used to	lend color to the robes of Buddhist monks and doubles as Natural	Yellow No. 3 in the commercial production of mustard, butter, orange	juice and processed cheese. In the 1870s, chemists discovered turmeric's orange-yellow root	powder turned reddish brown when exposed to alkaline chemicals. This discovery led to the development of "turmeric paper," thin	strips of tissue brushed with a decoction of turmeric, then dried. During the late 19th century, turmeric paper was used in	laboratories around the world to test for alkalinity. Eventually,	it was replaced by litmus paper, which is still used today. American chemists used turmeric paper, but not even the botanically	oriented 19th-century Eclectic physicians had much use for turmeric itself. Turmeric is a perennial with pulpy, orange, tuberous roots that	grow to about 2 feet in length. The aerial parts, which reach 3	feet, include large, lily-like leaves, a thick, squat, central flower spike, and funnel-shaped yellow flowers. 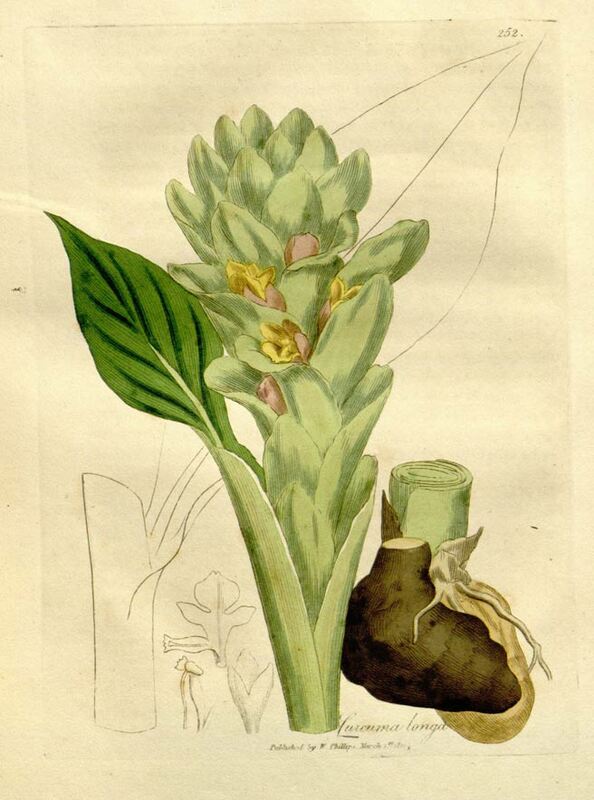 As a member of the Zingiberaceae family, turmeric is related to ginger. It is also known as Indian saffron because it is similar in character but a more economical alternative to the real thing.